The leaves are just starting to change and there is still time to plan a your fall foliage getaway to Eureka Springs, Arkansas. Planning a fall foliage vacation in the Ozarks does not have to be boring! While you are in town, don’t miss these great ways to get out and truly enjoy fall foliage peak week in Eureka Springs! If you have a taste for adventure, imagine soaring through the fall treetops on a zipline! Ozark Mountain Ziplines offers just that! A 2 hour Zipline Canopy Tour allows participants to experience a secluded outdoor tree based adventure from high in the Beautiful Ozark Mountain treetops. 10 zip lines, ranging from 200 to 2000 feet in length are suspended in tree platforms. Take in beautiful long-range views of the Ozark Mountains and explore the forest from 20 feet to over 275 feet in the air! Buy your Tickets Today! Relax on the Belle of the Ozarks, a 1 hour & 15 min. Beaver Lake Cruise. See the spectacular panorama of Beaver Lake’s shoreline, a pristine island wildlife sanctuary, and learn about numerous historical and natural points of interest. This cruis is particularly beautiful during Peak Week. You might even spot a few bald eagles! Buy your Tickets Today! High atop the Crescent Hotel in Eureka Springs you will find the Sky Bar Gourmet Pizzeria. Not only has it been voted Best Pizza in Eureka Springs, it also offers the best views of the Ozark Mountains. Don’t believe me? See for your self on the Crescent Hotel’s Fall Foliage Webcam. These fourth-floor views of the surrounding Ozarks Mountains will take anyone’s breath away! Eureka Springs is best known for the dozens of natural springs in and around this charming Victorian town.If you know where to look, you can see a couple of waterfalls! Just a little off the beaten path are a few breath-taking Ozark waterfalls. Here are some nearby waterfalls to explore during the spring season. To view the majestic beauty of Fall in the Ozarks, you don’t even need to leave Eureka Springs! This beautiful town is nestled directly in the Ozark Mountain sides. 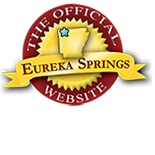 Whether this is your very first visit to Eureka Springs, or if you’ve been here many times before, if you have never taken the tram tour before or have not taken one recently, then you really need to do so now. The open-air tram will let you enjoy all of the majestic beauty of this mountain town from the comfort of your seat! Buy your Tickets Today! This entry was posted on October 19, 2017 by service424 in Attractions, Crescent Hotel, Family Fun, Fun Downtown, The Great Outdoors, Things to Do, Weekday Getaway and tagged beaver lake, Belle of the Ozarks, dining, eagle, Fall Foliage, leaves, pizza, Tram Tours, ziplines.